The logical follow-up to a post on The Midnight Special is an ode to Friday Night Videos, something that is absolutely part of the GenX experience, as we were likely the only generation to have cared. Not a lot of people got as excited as I did about The Midnight Special. Perhaps this one will be more meaningful. But some performers took advantage of the artistic opportunities to tell a story. Duran Duran did this by hiring up-and-coming director Russell Mulcahy to produce their videos in gorgeous locations with “exciting” plots. A-ha’s video for Take On Me married live action with animation, and likely caught the attention of more than just the teenage girls who were their fan base. Michael Jackson took it to a new level with the 13-minute Thriller, directed by John Landis. 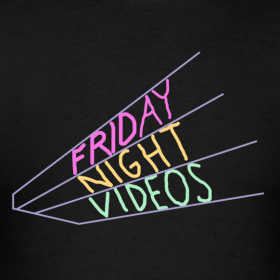 Friday Night Videos was many then-teenage GenXer’s introduction to music videos. Access to MTV was limited. In our town, it was a “premium” channel not included in the basic cable package. Even if you had cable, it was hard for some young people to convince their parents that watching music videos was as important as having access to the collection of film features available on HBO. I saw my first videos on HBO’s Video Jukebox (as my parents questioned the relevance of watching music), but Friday Night Videos changed every week, whereas Video Jukebox ran the same series for a whole month. YouTube is not a great source of material on Friday Night Videos, as it is for The Midnight Special. Perhaps Time-Life needs to work up a Friday Night Videos DVD set and sell it on late-night TV. We can see all the videos themselves on YouTube, but how many of us have the energy to curate it the way NBC did back in the 80s? This entry was posted in Rock-tales. Great post! I remember those days and having to go over to someone’s house who could afford premium channels in order to watch MTV. Great link also! Keep up the good work!